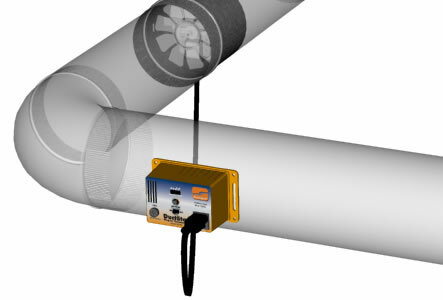 The DuctStat® simplifies installation of Suncourt In-Line Duct Fans™ by eliminating electrical connections at the furnace. • Control various devices, including alarms, heat lamps, lights, louvers, etc. Suncourt Inline Fans-Use a DuctStat to turn an Inline Fan on or off that is installed in the ductwork. This keeps you from having to run potentially long wires back to a fan motor in your furnace and reading its wiring diagram to correctly connect the wires. Lights-The DuctStat can be used to turn on a light bulb or heat lamp when the temperature falls below your set point in a hot box or other contained space that you want to keep above a certain minimum temperature. Hydroponics- Indoor gardeners use the DuctStat to turn on fans to help cool hot grow lights. Ventilation-The DuctStat can activate a wide variety of fans if temperature in a room or space rises above a user-determined maximum. How does the Suncourt DuctStat work? The DuctStat contains a thermistor, which is a very sensitive temperature-sensing device. When the thermistor detects a change in temperature from your set point the DuctStat activates. The min/max switch on its face controls the maximum differential between on and off. 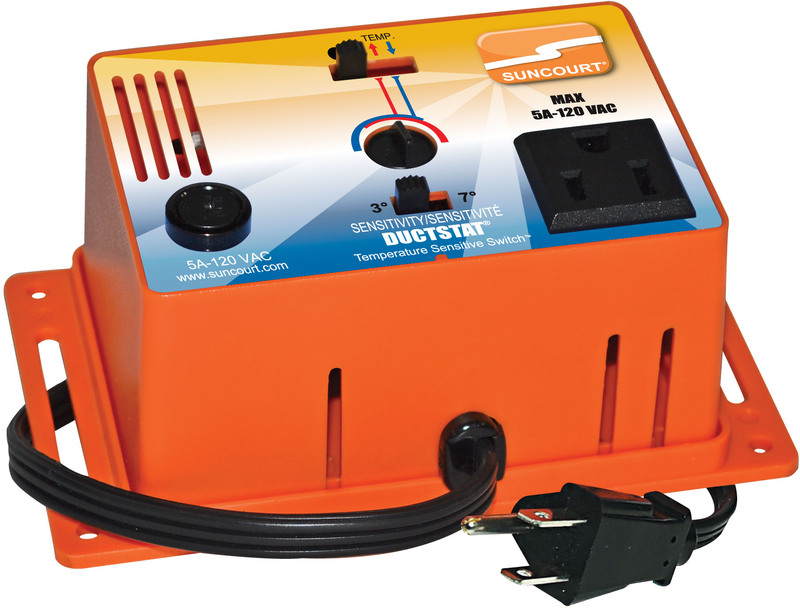 Max stands for maximum differential of about 7 degrees F. Min stands for minimum differential of about 3 degrees F. Simply plug-in your 110 volt device to the DuctStat’s grounded outlet and begin the setting procedure described in the included instructions. If you want the DuctStat to turn a device on when the temperature rises above your set point you put it on the heat setting. If you want the DuctStat to turn a device on when the temperature falls below your set point you will want to put it on its cool setting. The DuctStat will deactivate when the temperature returns to your predetermined set point. Please see the operating instructions for more detail on setting the DuctStat.